Sue Craig, the former East Brighton Bygones website editor, had the idea of bring her local community history and people together not just through creating a website which showed local history in pictures but by noting one of the trends of the moment – knitting! She was inspired to combine an old time craft with her local history, knitting a map of her hometown – the 1792 Terrier, or ownership, map of Brighton and Hove. Sue talks about how it all began and where it’s going now. “It was the East Brighton Bygones (EEB) exhibition that kick started this knitting project. We decided to hold an exhibition as our online archive had grown so large and was so full of interesting images and artefacts but many EBB members were not able to access the internet. The collection had grown quickly to include hundreds of photographs, but I needed a focus for the exhibition. I thought about where I live, Kemp Town and the area owned by the Marquis of Bristol in the 1830s, I live o pp osite his house, and round the corner from St Mary’s Hall School and Archives for which Sue Carnochan is archivist. Lord Bristol had given land for the school and for a chapel and was instrumental in the growth of the area north of Kemp Town. I got a large printout of the land he owned to look at the changes in the landscape, and I got hold of the 1792 Brighton map to compare the development over time. The map was amazing it showed changes in the landscape over different periods of time, split into Laines and furlongs that looked like strips of colour. And then it hit me! This map is the only one of its kind and I could see straight away how someone could knit a strip of land as each furlong divides into strips of land, laid down in Saxon times, known as ‘paul pieces’. I loved the link with the past, and it was a wonderful way of integrating local history, the development of the town and the local people. A perfect focus for the exhibition. To begin with, it was planned to involve local school children to help in knitting strips for this beautiful map as it seemed a good way of introducing them to their local history and a tradition that is in danger of being lost (no longer taught in schools). This multidimensional project incorporates local geography, history, art and craft so they’d be learning as they go along. However, health and safety issues prevented the involvement of local primary schoolchildren. With the help of the staff at St Mary’s Hall school, particularly Sue Carnochan, the exhibition was held at the school’s chapel, St Marks Church. 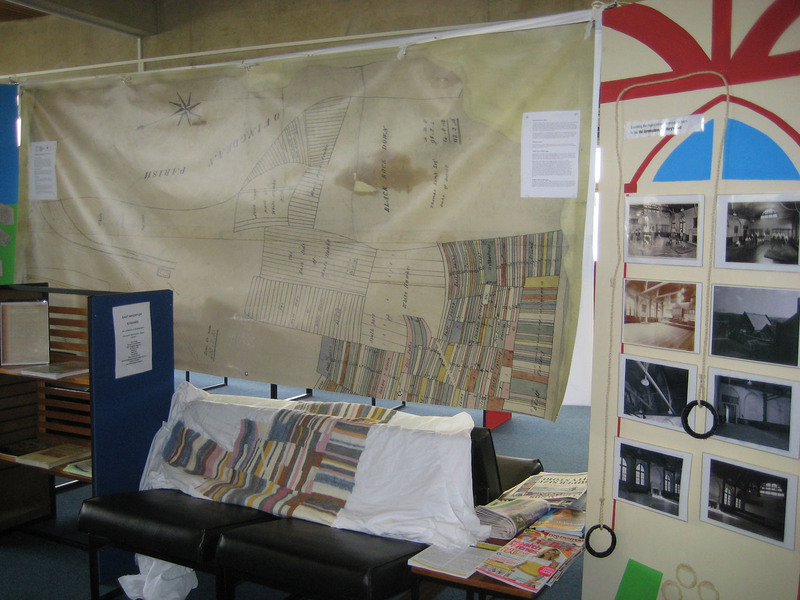 At the exhibition, we asked visitors as they sat chatting and having coffee to perhaps knit a strip and Hazel Imbert took over supervising the process as the map began to grow. The first three of 40 furlongs were finished in four weeks. As the idea got bigger, more volunteers were needed and I realised a lot of research needed to go into getting all products needed for it, having had such a local involvement, I wanted to keep the whole thing locally based from the wool, colour dyes, locally grown plants and flowers to get the dyes, spinning the wool, knitting, weaving and finally exhibiting, so that it means more to everyone here. This is an organic project done locally with little to no money; it has everything to do with people, craft, energy, and art coming together. Getting volunteers has been easier and quicker than the research – we will have lots of willing knitters who are really good and the chair of the East Sussex Weavers, Dyers and Spinners group has already spun silk for embroidering the key to show who owned each strip of land in the top corner of the map, and my daughter is going to felt the water stain. So it will have four dimensions, knitted, woven, embroidered and felt and when it’s finished the map will be a 16 foot by 7 foot triumph created by local people, about local people, for local people. Owned by its makers and sourcing local natural products gives the map a richer experience for everyone involved. So far it’s taken a year to explore and research what I need and how to go about it. Ideally I’d want to complete it in three years but it’s such an organic process that it could take longer. 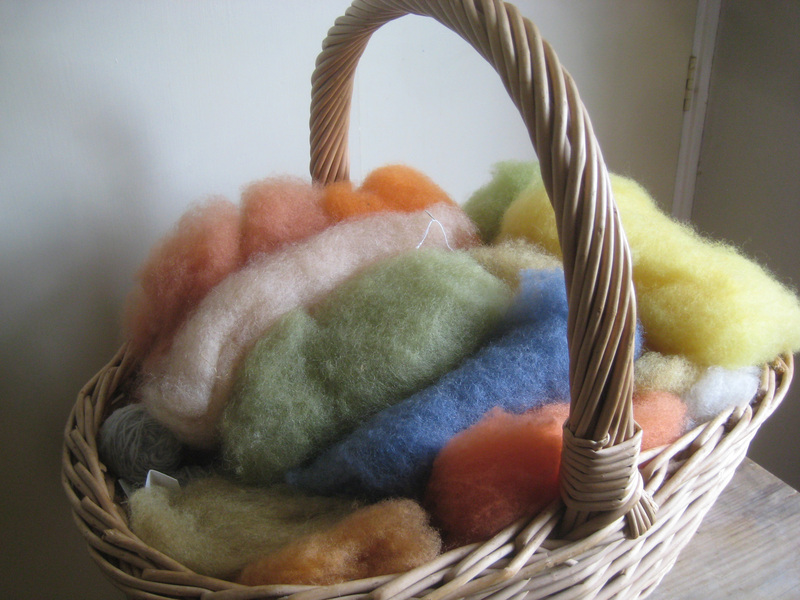 It’s an amazing adventure – learning to grow our own woad, to spin, to weave, to dye, getting the map digitised, and finding out about how much wool we will need. I’m learning so many rewarding skills, steeped in ancient tradition. At times I’ve almost felt swept back in time when spinning, sitting and sharing other spinners’ craft and stories: spinning yarns and spinning ‘yarns’. It’s a real labour of love.